Art by Brooke A. Allen. Here’s a list of my recommended non-Big Two (i.e., not Marvel or DC) independent comics. I’ll try to favor trade paperbacks/graphic novels where possible. Life With Archie. This series featured the Riverdale gang as adults in their 20s, where they’ve finally moved on from their eternal adolescence and forced to adjust as a result. Sabrina the Teenage Witch (manga). Sabrina’s comic in the late 2000s switched to a Japanese manga style. This run featured an extensive storyline about problems within both the Magic Realm and the Witches’ Council. Jughead’s Time Police. This short-lived early 1990s series saw Jughead become a time-travelling officer for a 29th century Timecop-like police force. 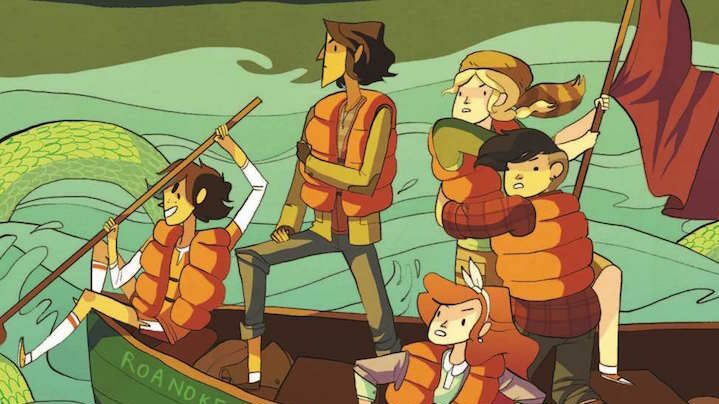 Lumberjanes. The popular series about a group of girls at a summer camp with bizarre, supernatural goings-on. Goldie Vance. The mystery-solving adventures of a young African-American girl at a Florida summer resort in the early 1960s. Mega Princess. The adventures of a princess who wants to be a detective. The Backstagers. A male counterpart to “Lumberjanes,” this series features the adventures of a group of stagehands at an all-boys high school. Said backstage features supernatural goings-on, of course. The Life and Times of Scrooge McDuck. Don Rosa’s classic series about the life story of Scrooge McDuck, the world’s richest tightwad (and comics’ richest character hands-down). Carl Barks’ Donald Duck and Uncle Scrooge stories. Classic stories by Barks about these two classic Disney characters (the latter created by Barks himself). Reprinted in various formats, most recently in a series of hardcover books by Fantagraphics. Love and Capes. Thom Zahler’s romantic comedy about the lives of the Crusader and Abby, Superman/Lois Lane pastiches, and their cast of family and friends. Long Distance. Zahler’s miniseries (unrelated to “Love and Capes”) about a couple in a long-distance relationship. Atomic Robo. The adventures of a robot built by Nicola Tesla, as he fights various science fiction threats. This includes the relentless (but somehow successful) scientific stupidity of Dr. Dinosaur, a sentient dinosaur mad scientist, with emphasis on the “mad” part. Oddly Normal. A series of graphic novels about a young girl and her adventures in the imaginary creature-filled realm her now-missing mother originally hails from. Copperhead. A sci-fi Western about a single mother from Earth who’s the new sheriff of an Old West frontier-like distant planet. Reed Gunther. A (regular) Western about a cowboy and his pet bear’s various adventures. Bakuman. A series about a pair of teenage friends who try to break into the Japanese manga industry. Yotsuba&!. A series about Yotsuba, an overly excitable, energetic five-year-old girl, and her father, neighbors, and friends. There’s various other graphic novels I could recommend, but I might not have thought of them right away. However, if I do think of others, or read others worth listing, I’ll update this post.